Native plants are an important part of our ecosystem due to their many benefits, but their numbers are quickly dwindling. A new program by the Land and Water Resources Department aims to encourage more native gardens around Dane County. The program, called Plant Dane, is growing and offering free native plants to schools and community centers. Native plant gardens can be quite costly due to the high price of native plants. By offering free plants from the county, schools and communities that previously didn't have the money to create a garden now can. Plant Dane was created when the Department of Land and Water Resources worked with groups that wanted to encourage environmental education. Their goal was to create outdoor classrooms with native gardens, but they quickly found out that the price of native plants was too great for many schools. Thus, the idea of providing free plants to the community was born. Now, Plant Dane has been running for two years and is spreading steadily. So far, 4,700 native plants have been grown and distributed to 15 schools and 16 community centers. This program works by taking plants, donated from community members or grown by local volunteers, and giving them to schools and community groups that apply for them. Today, much of Dane County is concealed by impenetrable surfaces such as streets, parking lots, compacted lawns, and heavily-tilled agricultural fields. Since these surfaces cannot absorb enough water, leftover water runs off over the land and picks up pollutants, sediment, and nutrients and transports them into our streams, rivers, and lakes. 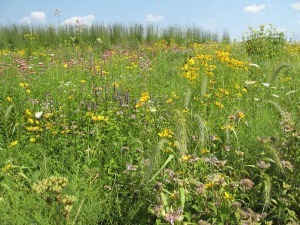 Native plant-covered landscapes solve this issue by absorbing water, thus improving water quality. The dwindling native plant population also negatively affects animals. Native species struggle to adapt as their sources of food and shelter disappear. By creating native plant gardens, Plant Dane is able to provide resources for various pollinators and other native species. The major purposes of this project are education and environmental benefit. Plant Dane seeks to increase awareness of native plants and their impact by distributing these plants to places that will implement them in learning gardens and outdoor classrooms. These gardens also help the environment. As discussed previously, the long roots of native plants soak up more water, help prevent runoff, and benefit native species. It’s important to have a lot of native plants because they can help stop the runoff that threatens our water sources. Schools and community centers that want to create native plant gardens can apply to the Plant Dane project. Before applying, they must do a simple water drainage and soil nutrient test to demonstrate that the plants will survive in their gardens. Since the Plant Dane project aims to teach about the environment along with distributing native plants, applicants who demonstrate that their gardens will be used for learning purposes are given priority. For more information on the project, check the Ripple Effects website under “Rain Gardens”, and look for “Plant Dane”. Any schools or community groups interested in applying can submit applications on the Dane County Office of Lakes and Watersheds by the July 22 deadline.